With a diabetic foot, a wound as small as a blister from wearing a shoe that's too tight can cause a lot of damage. Diabetes decreases blood flow, so injuries are slow to heal. When your wound is not healing, it's at risk of infection. As a diabetic, your infections spread quickly. If you have diabetes, you should inspect your feet every day. Look for puncture wounds, bruises, pressure areas, redness, warmth, blisters, ulcers, scratches, cuts and nail problems. Get someone to help you, or use a mirror. When one's feet become numb, they are at risk of becoming deformed. One way this happens is through ulcers. Open sores may become infected. Another way is the bone condition Charcot (pronounced "sharko") foot. This is one of the most serious foot problems you can face. The shape of one's foot can change when the bones fracture and disintegrate, and yet they continue to walk on it because it doesn't hurt. Diabetic foot ulcers and early phases of Charcot fractures can be treated with a special type of cast, a total contact cast. Dr. Barnes aims to play a critical role in the prevention of lower extremity amputations through extensive preventative care. This involves callus and nail care before an infection can result, and the fitting of custom and extra-depth diabetic footwear and inserts. The Step Ahead Foot & Ankle Clinic is well-equipped with easily accessible Podiatry Chairs that make at-risk foot care (nail & callus care) easy for the patient. Even with all attempts at conservative care, some ulcerations are best managed with surgical treatment of the underlying biomechanical concern resulting in the ulceration failing to heal (or continuing to recur), and some infections best managed with surgery. Dr. Barnes knows when surgery is best, and are well-trained in the surgical management of diabetic foot infections and diabetic foot reconstruction. With any treatment approach, though, the patient is always included in the process, all options thoroughly discussed, along with the pros and cons, and the patient made an integral part of his / her care. Custom foot orthoses (“orthotics”) are prescription medical devices that are designed to control alignment and function of the foot in order to prevent or treat injury-causing motions such as pronation (rolling-in) and supination (rolling-out). They also can act to redistribute pressure on the bottom of the foot to relieve pain from excessive pressure or calluses. This is what makes them valuable to diabetics and crucial to good diabetic foot care. Diabetic shoes, sometimes referred to as extra depth, therapeutic shoes, are specially designed shoes, oftentimes prescribed with prescription inserts, are a critical component to preventative foot care, as they have been shown to reduce the risk of skin breakdown in diabetics with pre-existing foot disease. When you are fit for diabetic shoes, (after having been evaluated by your podiatrist and prescribed diabetic shoes), you should be measured by a skilled technician and shoe fitter, and great time should be taken to find the appropriate shape and style shoe to meet your needs. This is a priority at Step Ahead Foot & Ankle Clinic, where each one of our shoe fitters has completed advanced shoe fitter training. Many insurances cover the cost, or a portion of the cost, for diabetic shoes, if certain criteria are met (not only does a patient usually have to have diabetes, have their diabetes under the management of an MD/DO, but they have to have certain risk factors related to the feet, such as neuropathy, calluses, or toe deformities). Dr. Barnes at Step Ahead will be happy to evaluate your feet and review your medical record, to see if you qualify. If you qualify, the Billing Specialist at Step Ahead would be happy to relay to you what the cost may be. 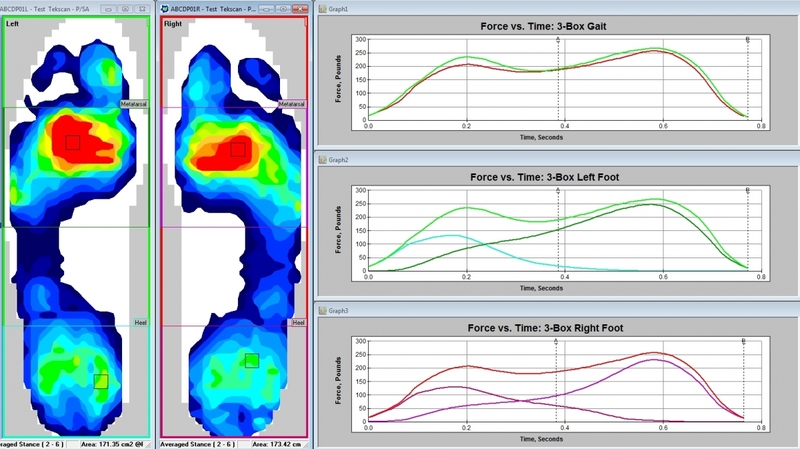 Step Ahead Foot & Ankle Clinic offers computerized gait analysis using theF-Scan® in-shoe pressure measurement system. This state-of-the-art system allows us to “see inside the shoe, giving us a better understanding of how a person’s foot interacts with their footwear and helping us provide the best, most advanced care in the area. People with diabetes have an increased risk of developing pressure ulcers, which increase the likelihood of an eventual amputation. Ulcers occur when sustained pressure in a specific area causes tissue to break down – they are literally wounds that develop “from the inside out." Offloading, or redistributing pressure from these areas is an important part of preventing and healing pressure ulcers. The F-Scan system is often used to help find and address the root cause of these problems by clearly quantifying areas of high pressure in a color-coded display. It also provides us with timing and gait parameters we can use to develop optimal treatments for each individual. We can easily share a patient’s test results with them, making it easier to explain diagnoses and treatments. Diabetic orthotics can be modified on site, with the assistance of the In-shoe pressure measurement system, the results of which can be tested immediately and on-site as well. This results in decreased risk of ulceration recurrence or progression, faster ulceration healing times, and less risk of major limb amputation. Not only can diabetics benefit from an F-Scan exam –athletes looking to improve their performance anyone suffering from foot, knee, hip or lower back pain may also benefit. Even with all attempts at conservative care, some ulcerations and infections are best managed with Surgery. Some ulcerations are best managed with the surgical treatment of the underlying biomechanical concern leading to the ulceration failing to heal (or continuing to recur), and some infections best managed with urgent surgery. Dr. Barnes knows when surgery is best, and are well-trained in the surgical management of diabetic foot infections and diabetic foot reconstruction. With any treatment approach, though, the patient is always included in the process, all options thoroughly discussed, along with the pros and cons, and the patient made an integral part of his or her care. Dr. Esther Barnes completed her 3-year surgical residency at Presbyterian - St. Luke's Medical Center in Denver, CO. Dr. Barnes is a diplomat of the American Board of Foot & Ankle Surgery, Certified in Foot and Reconstructive Rearfoot / Ankle Surgery, the highest achievement which can be obtained as a Podiatric Surgeon, and a Fellow of the American College of Foot and Ankle Surgeons. She is also a Fellow of the American Professional Wound Care Association. Dr. Barnes has surgical privileges at Kalispell Regional Medical Center, The Surgery Center atHealthCenter Northwest, Flathead Orthopedic Center, and North Valley Hospital.